​Symptoms of this disease include tomato plants with lower leaves that become yellow (chlorotic) and die; plants that begin to wilt; a lesion on the lower stem at ground level (Figures 1 and 2). 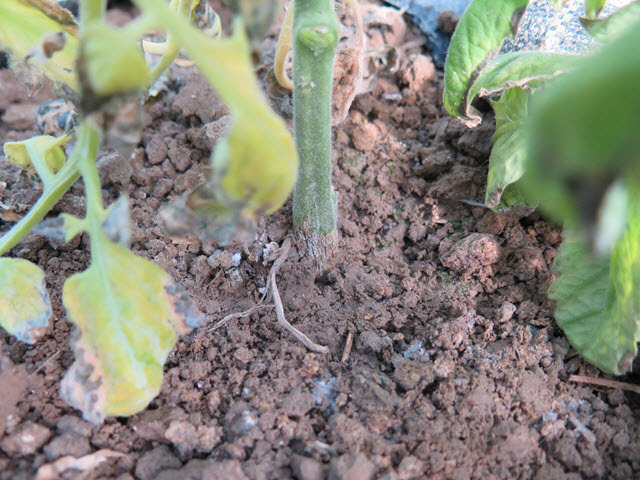 If tomato plants are removed from the soil and carefully split open from the ground level, a discoloration of the vascular tissue can be observed (Figure 3). It is important to note that this discoloration does not extend up the stem more than 6 to 8 inches. If the discoloration extends up into the plant canopy, the disease may be Fusarium wilt of tomato. 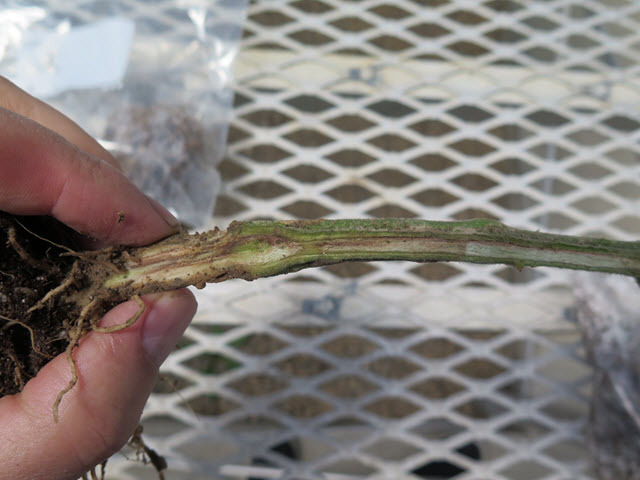 Although growers may observe multiple plants begin to die of this disease over a period of days or even weeks, the fungus does not splash from plant to plant. Therefore, there should be no plant-to-plant spread in the high tunnel. Temperatures from 68 to 72°F favor Fusarium crown rot and may explain why I observed this disease last week when the weather was relatively cool. I often observe Fusarium crown rot in high tunnel or greenhouse situations where the tomato plants are grown in the ground. This is because the causal fungus, Fusarium oxysporum f.sp. radicis-lycopersici, survives very well in the soil in the absence of the host. Crop rotations that do not include tomatoes or other solanaceous crops will help to lower the amount of fungal spores in the soil. However, since the causal fungus survives for years without a host, crop rotation is not a complete solution. I also realize that many growers who produce tomatoes in high tunnels do not feel it is economically practical to rotate to another crop. To such growers, I would point to this article about how to minimize diseases in high tunnels. 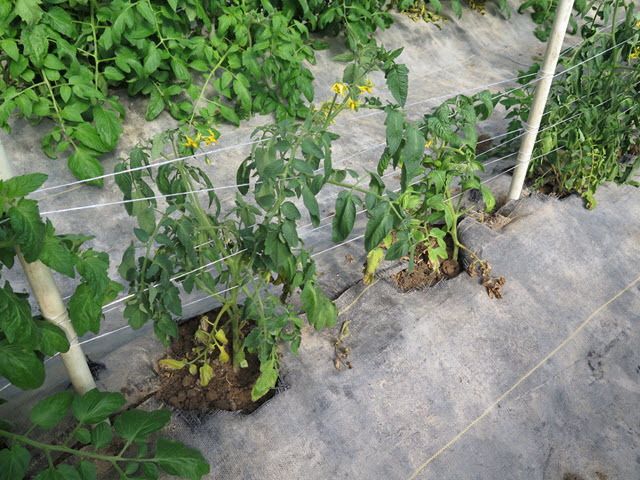 Growers who plant tomatoes in bags or pots in a high tunnel instead of in the soil should avoid Fusarium crown rot since the fungus survives in the soil. Check with your seed representative or seed catalog for tomato varieties with resistance to Fusarium crown rot. Most tomato varieties with resistance to Fusarium crown rot are indeterminate. (In contrast, there are many varieties with host resistance to Fusarium wilt.) It is possible to graft your favorite tomato variety as a scion onto a rootstock variety with resistance. This​ table will help one select tomato rootstocks with resistance to Fusarium crown rot and other diseases. Some tomato seed companies will sell grafted tomatoes. There are no fungicides to control Fusarium crown rot. Most fungicides are for foliar use; I know of no fungicides that may be sprayed on the top of the soil. Read the label carefully and contact me if you have questions. Figure 1. Stunted, wilted, tomato plants. Figure 2. Lesion at base of stem. Figure 3. Discolored vascular tissue.